The Ibanez 2018 RGIX7FDLB Iron Label 7-String Electric Guitar in Northern Lights Burst is perfect for players who are looking to step up to an extended range model from a 6-string. The guitar will equally please experienced players who need a consistent performer that can keep up with a demanding player. 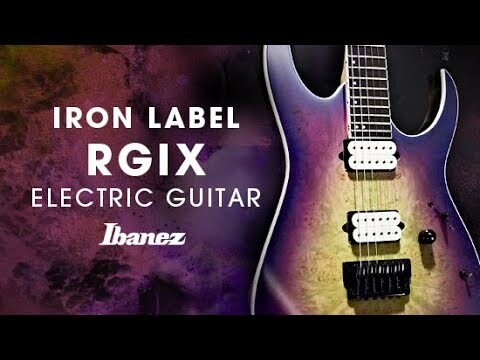 The RGIX7FDLB is an Iron Label model through and through, featuring Ibanez' peerless craftsmanship and a durability that belies is delicately executed curves. The slender body depth marries beautifully to the elegant contours of the RG profile to establish a delightfully familiar feel in the hands. The upper bout rolls off sweetly to establish a comfortable playing feel for the picking arm, removing any impediments from your path to ensure complete freedom. The body is built using ash, a solid and durable tonewood that produces an enviable mid-range warmth. Whether you're thundering through beefy low-end riffs, laying down some meaty mid-range chops, or searing through high-end solos, the body's beating heart is the engine that keeps you power Paired with the ash is a laurel burl top, which is finished in a mesmerising Northern Lights Burst that gives it a unique visual aesthetic. Ibanez know a thing or two when it comes to crafting extended range necks, and the RGIX7FDLB benefits from their wealth of experience. Joined to the body is a solid three-piece maple/purpleheart neck, which is as strong and supportive as they come. Shaped to the Nitro Wizard-7 profile, the neck slots perfectly into the crook of your hand, and the deep double-cutaway body profile allows you to reach the upper frets with ease. Paired with the neck is sumptuous 24-fret ebony fingerboard, which is decorated with luminescent side dot position inlays to guide your way on the darkest of stages. Fingerboard binding affords seamless transitions between each and every fret for the smoothest of performances. The Ibanez 2018 RGIX7FDLB is equipped with a pair of DiMarzio Fusion Edge humbuckers, which make the most of the extended tonal range of the RGIX7FDLB. From the guttural low-end grind to the searing heat of the high notes, these beauties produce a generous tonal palette for you to paint with. Whether you're fingerpicking, flat-picking, or hybrid picking with some tapping thrown in, each and every note rings out with marvellous clarity. With a coil-tap switch at your disposal, you can unlock greater tone-shaping potential to take expand your tonal universe even further. The Ibanez 2018 RGIX7FDLB Iron Label Electric Guitar is equipped with a Gibraltar Standard II-7 bridge, which anchors each string securely to optimise intonation and sustain. The headstock is home to Gotoh MG-T locking machines heads, which work tirelessly to uphold tuning integrity with absolute precision, getting you through every gig in style.